The Gecko Trail is our triple-day wilderness hiking trail established in 2003. This unique (!) hiking trail is shaped like a Triskelion with Simonskloof in the centre and a combined total length of 47km. The concept allows you to pick any one or two of the routes, choose where to start, where to end and in which direction you wish to hike. In short three linear day routes with three stop/start points. Route A connects the Nuy valley near Worcester, via the Nuy River Gorge with Simonskloof. This is a combination of flat farm tracks and difficult scrambling route with ±14 river crossings and a steep ascent. Route B takes you from Simonskloof along the ridge of the Langeberg and via the Naudesberg summit to Langdam guest farm or Tolbos farm in the Koo valley. Route C follows Route B for the first 2.5km and then descends into Paardekloof before climbing up to Penhill’s ridge and down their trail to the Manor. This route has one of the toughest scrambling and bushwhacking elements along the Gecko Trail. Each route is a day’s hike of ±8 hours for fit hikers. Route D a future extension of the trail will connect the Gecko with the famous Arangieskop hiking trail above Robertson. It is still in the planning stage, yet since 2012 route C & D form part of the annual Rim of Africa, a 650km mountain traverse. This connects us with the Hex River Valley and Montagu, a wilderness trekking experience out of the ordinary! Where do you sleep? The end and starting points of each route offers an array of accommodation options. Those need to be booked independently and well in advance, see details in Fact file below. At Simonskloof we recommend Camping. 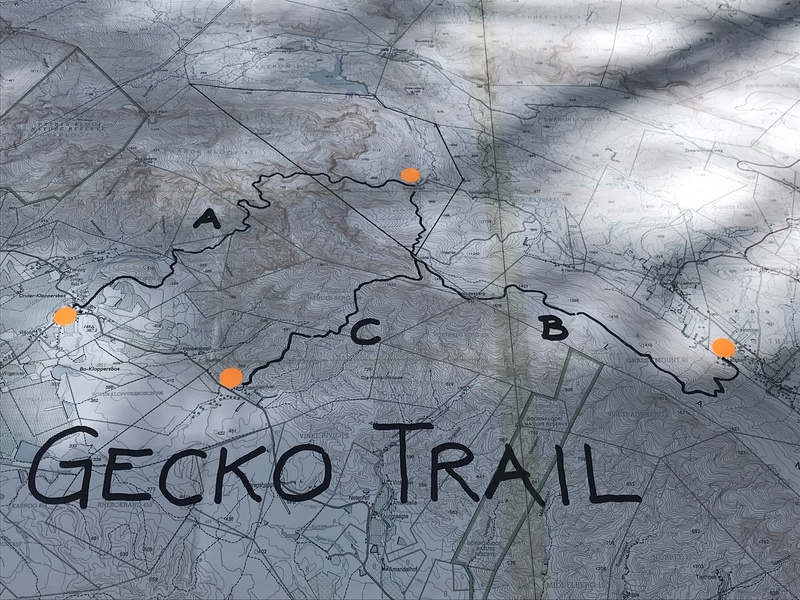 With your hiking permit you will receive written hiking directions, the latest map and a profile of each route of the Gecko Trail. Type of Trail: Wilderness routes, marked by rock cairns with occasional scrambling, bushwhacking and river crossing in “knee-deep” water or over boulders. Game: Rhebok, Leopard, Baboons and … Geckos! Water: Springs, Mountain Streams and a River, except for Route C which is mostly dry! Highest point: Route A: 885m – Route B: 1644m a.s.l. – Route C: 1430m a.s.l. Best time: March to November – Very HOT in Summer! Direction of hike: Any direction – Please state when making a reservation! 33°39.469′ S 19°37.993′ E at 310m a.s.l. 33°36.953′ S 19°43.649′ E at 770m a.s.l. 33°39.947′ S 19°48.469′ E at 970m a.s.l. 33°40.324′ S 19°40.890′ E at 447m a.s.l.
. . . because life was meant to be an Adventure !